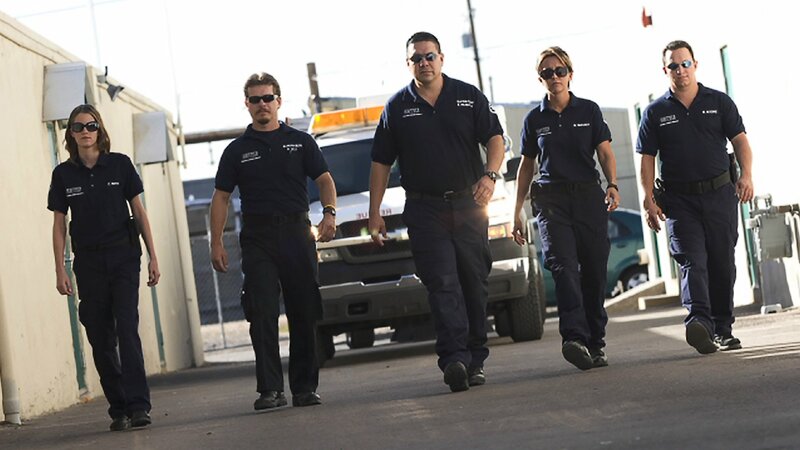 A mix of detective work and medical emergency rescues make up the daily grind for investigators and emergency animal medical technicians at the Arizona Humane Society who do their utmost to protect the interests of animals in Phoenix. A dog is tied in a front yard with one of it's legs missing. Disease and deformities are uncovered in fifty animals found at the home of a former breeder. Two dogs are found tied in a backyard without shade; a dog's embedded collar has exposed it's jugular vein. A dog is found dead and two others severely emaciated and suffering from tick fever. A dog gives birth in an alley and the pups struggle to survive; Tamie Kinsel pleads for the life of an injured bird. An X-ray provides surprising evidence in an investigation of a case involving three starving dogs. A dog is rescued after being hog-tied and left to die in a dumpster. An investigator works to save a puppy that someone tried to kill. Investigator Marlynn Barkley tries to save a dog that has been left for dead by its owners. A cat is brought into the shelter with its paws missing. A dog with matted fur and an embedded harness is brought to the shelter. Investigators confront the owner of six emaciated dogs that have mange. Officers investigate reports of an illegal dog fight. In some cases investigators' intervention makes the difference between life and death.